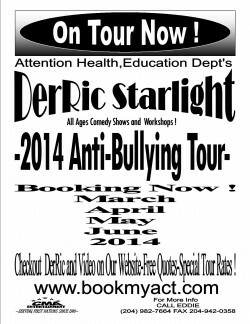 DerRic Starlights Bullying Tour and Comedy Shows are Available for 2014 Bookings. DerRics Anti-Bulling Tour is having a Big Impact on the kids everywhere he goes. The Tour For March April and May 2014 is now in the Booking Process ! or Call for Info ! DerRic Starlight is an incredible entertainer. Our students couldn’t get enough. His Anti-Bullying performance/workshop was a perfect fit for our school wide Champaign and a good lead up to our Day of Pink to show our support as a school, to stomp out bullying. We highly recommend DerRic to other schools/workshops/conferences as a very commendable speaker/performer. We were very pleased to have Mr. Starlight attend our school. His performance was amazing and his talent incredible. I have had numerous teachers stop off and tell me how impressed they were with what he did with the kids. The true tale of how well he performed was how engaged our students became. We were concerned at keeping them for one hour however that was not a problem once Mr. Starlight began his show. The kids wanted more. Thank you for this opportunity. DerRic Is Available for Comedy Shows ,Workshops , Keynote Speaks , MC Duties and Voice Overs for Radio and Television and Movies.